Bukola started out exploring her own voice with the deep rough soulful tones of Repeat Ophenda and in 2003 Bukola teamed up with D’syfa and the two began writing songs together. As they worked closely they evolved and grew together, constantly bouncing off each other’s ideas, talent, refining their skills and learning new ones along the way. ‘Hypnotised’ is the official single release taken from the debut album Which Way, which has had rave reviews in The US, South Africa and the Far East. 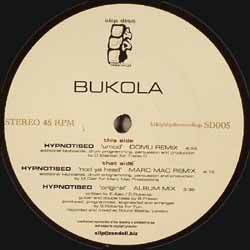 Bukola has teamed up with long time family and friends Domu and Marc Mac (4hero) giving us an original, mouthwatering single release. The single comes with 2 remixes. The first is courtesy of Domu, the infamous Reinforced Records legend Sonar Circle and Co-Op broken beat pioneer. This mix is for the more daring DJ’s to use within their sets as Domu pushes the boundaries of this club floor filler. Marc Mac brings us the second remix, which takes 'Hypnotized' back to basics, stripping it raw. This is a chilled out, nod your head mix, good for listening whilst relaxing. The single itself has a good strong steady beat, it’s catchy, especially with Bukola’s mesmerizing soul vocals. It truly is hypnotising.